When two editors connect at the Alberta Magazines Conference, a one-of-a-kind collaboration emerges. Some of the best partnerships are formed during the unscheduled moments of life—such as a coffee break at an AMPA conference. That’s where a one-of-a-kind collaboration between AHS’s Apple and Lethbridge College’s Wider Horizons started last spring, and the two teams are thrilled to see where it’s led their publications these past months. It all started when Wider Horizons editor Lisa Kozleski had been trying to figure out a way to write about the opioid crisis with limited staff and an even more limited budget. An alumnus had suggested a great angle—writing about how the crisis had changed so many of the ways college grads in policing, nursing, child and youth care, and more, did their work—but the story was so much bigger than that. As 2018 went on, it became clear Lethbridge was at the centre of so many important stories to tell. As Lisa wrestled with telling this story, she headed off to her first AMPA conference in Calgary—and—that’s where she met Terry Bullick, editor and publisher of Apple. The winter issues of Wider Horizons and Apple features an extended feature package on the opioid epidemic, with content from both magazines. The main college story focuses on how the opioid epidemic has changed the way their grads work—the very idea proposed to Lisa years ago by a Criminal Justice grad. And the Apple team provided a first-hand look at addiction written by Curtis Gillespie and photographed by David Guenther. 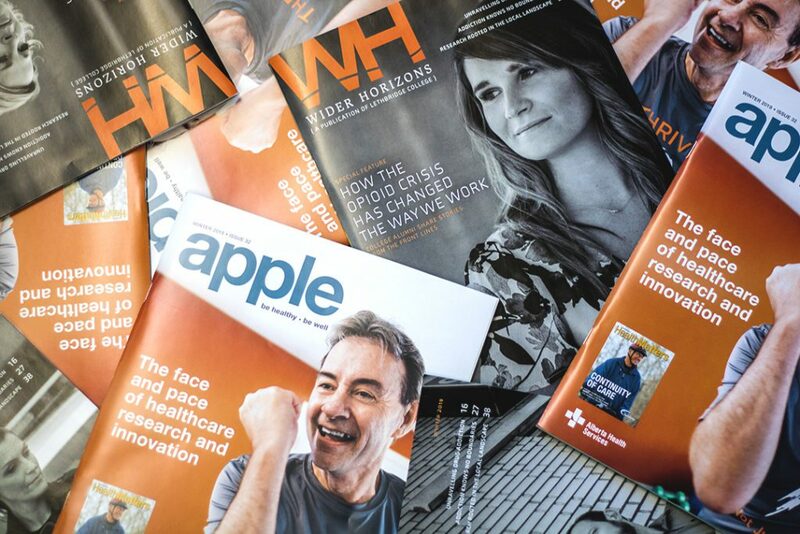 The combined content, includes additional facts and information about drug use and programs, appears in 30,000 copies of Wider Horizons and 140,000 copies of Apple — and is expected to reach more than 700,000 readers. One of the goals of Apple is to give readers insight into how their, their family’s and their community’s health is influenced. One of the goals of Wider Horizons is to celebrate the stories of the college’s alumni by promoting them throughout the community. This partnership between two Alberta public institutions achieves both these goals – and far surpass them. Lisa, Terry, new Apple editor Shelley Boettcher and the writers, designers, photographers and colleagues who worked on these packages are proud to share them with their readers. And they hope that whether they are picking up a copy of Apple or Wider Horizons, those readers will be better served, better informed and perhaps even a bit more compassionate after reading their stories and seeing their photos. It’s just one of many great things to come from an AMPA conference! Listen as Lisa Kozleski shares the importance of tackling this topic, how the idea was first ignited, and the impact of the stories published in Wider Horizons and Apple.